How to use Mandrill as SMTP server for WordPress site - Codeholic IT Services Pvt. Ltd.
1. Use a premium SMTP server. 2. Use a free (not boat-free though) SMTP that will fill your mails with spams and ads. 3. Use Mandrill fro free. 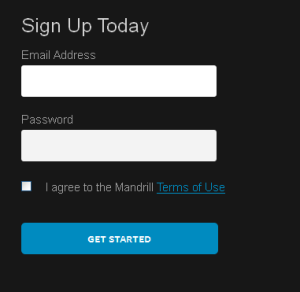 Now let get on to setting up Mandrill on your WordPress site. I will divide this whole process in two simple fronts. The first one includes getting you Mandrill account up and obtaining API key. In second step we will use wpmandrill wordpress plugin to send out mails. 2. Enter your email and choose password. 3. Login to Mandrill using your credentials. 5. From the following page, click on New API Key button. 6. A new API will have generated by now, note it down somewhere as it will be required in the next step. 1. Install and activate wpMandrill wordpress plugin. 2. From admin dashboard, click on Settings > Mandrill. 3. Now you just need to enter: 1) the API key from last step 2) From email. 4. That’s it. Save settings, send a test mail and check working.